Russia conducted its first orbital mission of 2018 on Thursday, February 1, by launching a Soyuz-2.1a booster with 11 satellites into space. 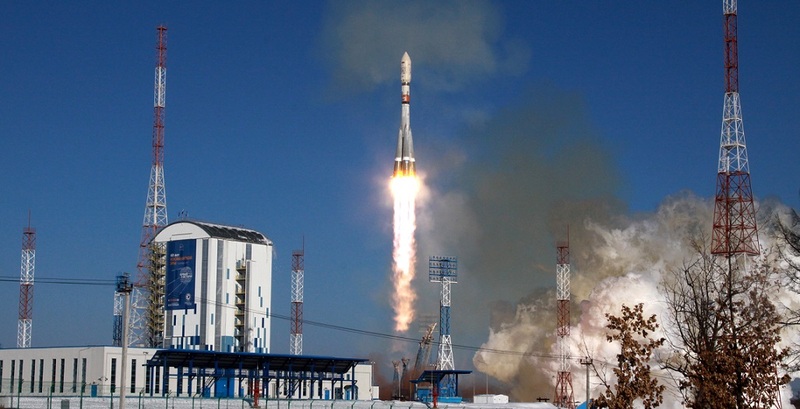 The rocket lifted off at 2:07 GMT (9:07 p.m. EST) from Site 1S at the Vostochny Cosmodrome in Russia’s Far East. The launch was initially scheduled for December 22, 2017, however Roscosmos decided to postpone it to February 2018. The decision was made after the November 28 failure of a Soyuz-2.1b rocket, when its Fregat-M upper stage suffered from a programming error and the flight resulted in the loss of all 19 satellites onboard. The postponement of Soyuz-2.1a launch from Vostochny enabled the mission controllers to perform additional checks of the software to make sure that everything will correctly during the flight. Given that the launch was originally planned for December 22, the rocket was shipped to the launch site on September 10. The primary payload of the mission - Kanopus V No. 3 and No. 4 satellites - were delivered to Vostochny one month later. The rocket and the 11 satellites were given green light for the launch on January 23 and three days later the engineers completed the integration of the launch vehicle with its payload. Rollout of the rocket to the launch pad was carried out on January 29. Igniting its four liquid-fueled strap-on boosters, the Soyuz-2.1a rocket thundered off from the pad and soared skyward, starting a short vertical ascent. The boosters were jettisoned about two minutes after launch. The rocket then continued the flight, being powered by its core stage alone. This stage used an RD-108A engine to accelerate the launch vehicle for nearly three minutes. Three minutes and 48 seconds into the flight, the payload fairing separated, and almost one minute later the core stage was detached from the rocket. Afterward, the second stage took control over the flight for the next four minutes and was separated nearly nine minutes after liftoff. The separation marked the beginning of the longest phase of the mission - a five-hour long trek of the Fregat-M upper stage to orbit and back to Earth for its re-entry into the atmosphere. Fregat-M first released the duo of Kanopus-V satellites at about one hour into the flight. Approximately one and a half hour later, it started the deployment of the secondary payload consisting of nine smaller satellites. Next, the upper stage conducted a pair of maneuvers to lower its orbit in order to perform a fiery atmospheric re-entry over the Pacific Ocean some five and a half hours into the flight. "Nine spacecraft from Germany and the United States have been separated [from the Fregat booster]. They have been delivered to the calculated orbits. The customers will start working with them in a while. Over the next 24 hours we will receive information on the spacecraft’ condition and how they work, but this is already the customers’ responsibility," said Igor Komarov, head of Roscosmos. Manufactured by the All-Russia Research Institute of Electromechanics (NPP VNIIEM), Kanopus V No. 3 and No. 4 are Earth-imaging satellites that will be operated by Roscosmos. Each spacecraft weighs around 1,042 lbs. (473 kilograms) and is fitted with two deployable solar arrays and three imaging instruments. The satellites will operate from a Sun-synchronous orbit (SSO) at an altitude of 317 miles (510 kilometers) for five years. Kanopus satellites will be used mainly for environmental monitoring, mapping, man-made and natural disaster detection and management, agricultural monitoring and fire detection. They are designed to provide wide-angle images to compliment the constellation of high-resolution Resurs satellites. Besides Russian Kanopus satellites, Thursday’s mission also launched five spacecraft for Germany: four S-NET nanosatellites and one D-Star ONE v 1.1 Phoenix CubeSat. Developed and operated by the Technical University of Berlin (TU Berlin), S-NET are nanosatellites cubical in shape, with a side length of 9.45 inches (24 centimeters) and a mass of 18.7 lbs. (8.5 kilograms). Their designed lifetime is one year. S-NET satellites are technology demonstrators to test a new type of S-Band inter-satellite and space-to-ground communications system. The spacecraft carry the SLink instrument - a compact transceiver system for S band communication links of small satellites in low-Earth orbit (LEO) environment. D-Star ONE v 1.1 Phoenix is a three-unit CubeSat built by German Orbital Systems, which is a copy of the original D-Star ONE that was lost on November 28. It weighs around 8.8 lbs. (4 kilograms) and is designed to be operational for one year. D-Star ONE v 1.1 Phoenix is a technology demonstrator for German Orbital Systems’ planned CubeSat communications constellation. The satellite is equipped with four identical radio modules with D-Star capabilities. On the mission manifest are also four Lemur-2 small satellites designated Lemur-2 No. 74-77. Built and operated by American company Spire Global, these three-unit CubeSats designed for meteorology and ship traffic tracking. They weigh 8.8 lbs. (4 kilograms) each and are equipped in a GPS radio occultation payload known as STRATOS and an Automated Identification System (AIS) payload named SENSE. The Soyuz-2.1a rocket employed for Thursday’s launch is 151 feet (46.1 meters) tall and has a diameter of 9.68 feet (2.95 meters). It can deliver payloads of up to 8.6 tons (7.8 metric tons) to a low-Earth orbit (LEO) and 3.1 tons (2.8 metric tons) to a geostationary transfer orbit (GTO). Thursday’s flight was Russia’s first orbital mission this year and the third launch from Vostochny in history. The country’s next launch is scheduled for February 11, when again a Soyuz-2.1a booster will take to the skies from the Baikonur Cosmodrome in Kazakhstan to deliver the Progress MS-08 cargo spacecraft to the International Space Station (ISS).